Spend your Pre-Black Friday with myplasticheart! 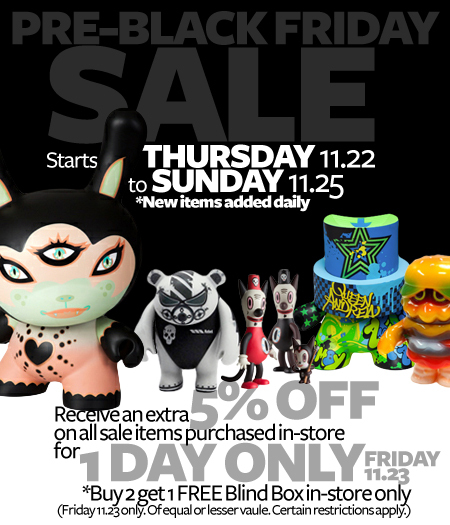 Stock up in time for the holidays with myplasticheart’s annual Pre-Black Friday Sale! Steep markdowns and big savings galore, the sale starts Thursday 11/22 Midnight and runs until Sunday 11/25. Receive additional savings when you shop in-store: for 1 day only on Friday 11/23, get an additional 5% off on all sale items, and take advantage of our buy 2 get 1 FREE offer (of equal or lesser value) on blind box items (certain restrictions apply) at this in-store only event. We’ll be updating with new items throughout the sale so keep checking back for the latest deals! You can also follow us on Twitter and Facebook as well as our blog for the latest updates and up to the minute special offers! The Pre-Black Friday sale is going to be both online here and in-store at our NYC location. The additional 5% and free blind box offer only apply to in-store sales.